My three Ottawa beer cans. In December, I had the opportunity to do a beer swap with Your Next Beer, a great blog for those who like a healthy dose of wit with their barley sandwiches. 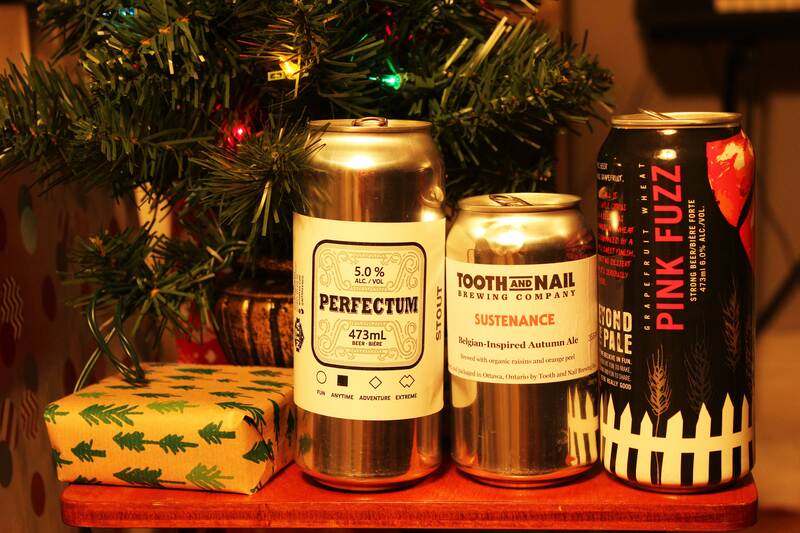 Dave, (Editor-in-Chief of YNB) published his review of Bellwoods beer on Sublime Imbibing, and I published my review of delicious Ottawa beer on his. The beers were Perfectum stout by Nita was a solid, thoroughly enjoyable beer, suitable for purist stout fans. There was also Sustenance from Tooth and Nail, a brilliant testament to Canada’s ability to pull of Belgian. Finally — and my personal favourite of the trio — Pink Fuzz by Beyond the Pale, proof that not all fruit beers annoy me. Check out my post below! While I certainly have no complaints with the Toronto beer scene, I have been hankering to break out and try some brews from beyond. Thankfully, Your Next Beer gave me the chance when they agreed to do an exchange between the provincial and federal capital. The three beers I was sent were all incredibly enjoyable (turns out Your Next Beer makes some damn good recommendations) but I’ve listed them in order of my favorites below with my rating and review… READ MORE.